Compucon New Zealand is a computing system manufacturer and a digital technology system integrator. Getting it right the first time and every time is setting Compucon apart from other computer vendors. The high performing Compucon system range has been developed from a pure engineering platform as opposed to the traditional marketing approach, and gained a reputation for unsurpassed quality in the reseller and user communities since its New Zealand launch in 1992. The company has master-minded the implementation of several physical video surveillance projects since 2008 with IP technologies (Internet Protocol). 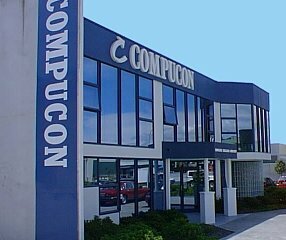 Compucon New Zealand has been 100% New Zealand owned since 1 April 2011. The Compucon team contributes to the success of our customers through our knowledge, excellence, commitment and supply of computing platforms and solutions meeting or exceeding customer expectations. By partnering with world class component manufacturers, Compucon is able to build high quality computer systems with long term consistency and compatibility guarantees. Our strict ISO quality managed production method helps us achieve reliability standards that statistics tell us we are offering the lowest failure rates achievable in the industry. Technical knowledge in these processes is a key factor to this stability. Compucon PC's are manufactured to users requirements while meeting the latest industry open systems standard. Consistency of components and prototype testing ensure seamless inter-operability with other systems. Compucon standards ensure low cost of ownership. Standardization reduces cost of upgrades, add-ons and out of warranty support. Many brands use proprietary or non-standard compliant parts, making changes problematic. Compucon's "just in time" philosophy means that standard systems are produced in 24hrs and Fileservers in 48hrs in Albany build-to-order facility. Compucon has an engineering support team in-house to help advise and support our integrators and vertical solution reseller channel nationwide. Compucon offers 24mth return base warranty on all parts and labour including the mouse and keyboard. Extensions to 3yrs RTB and 3yrs onsite options are available.